Gamblogger: Get Free Spins on RTG's New Snowmania Slot at Slotastic! Get Free Spins on RTG's New Snowmania Slot at Slotastic! Realtime Gaming introduced a new slot game for the holiday season today. 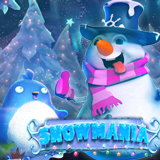 Slotastic has just added the frosty Snowmania slot game to its online and mobile casino. Snowmania is a wintery wonderland with RTG’s all new “crushing symbols” feature. Available November 23rd – November 30th only. Available November 23rd – December 15th only. New Christmas slot from RTG features new "Crushing Symbols". In this glittering new game, winning symbols are immediately “crushed” after wins are paid. New symbols appear giving extra chances for more wins. Thanks to the Morph Magic feature, prizes increase with each win -- x2 after the first crush, x3 after the next and x5 after that. Snowmania is just one of the festive Christmas slots at Slotastic, which specializes in real money slot games. While you're there, try Naughty or Nice, Santa Strikes Back and Rudolph’s Revenge!